The designer of the state wardrobe of the former Empress Farah Pahlavi of Iran was Iranian designer Keyvan Khosrovani. He was the (unpaid) designer for the Empress, at her behest, for over a decade and, in these creations, he was instrumental in reviving traditional Iranian textile design. Due to the political regime in Iran, he became exiled from his homeland, and is a long time resident and now citizen of France. Khosrovani is a designer of many things, including buildings, cultural events and fashion. Throughout his career, he has been an ambassador for Iranian culture and heritage. There are collections of his royal designs on display at the Niavaran Palace in Tehran and the Musée de la Mode et du Costume de Ville of Paris at the Palais Galliera in Paris. The De Beers diamond is the seventh largest diamond in the world. It was mined in South Africa in 1888 by the De Beers mining company and exhibited at the Paris Universal Exhibition of 1889. The Maharaja, Bhupinder Singh, of Patiala in the Punjab region of India, bought the De Beers diamond. 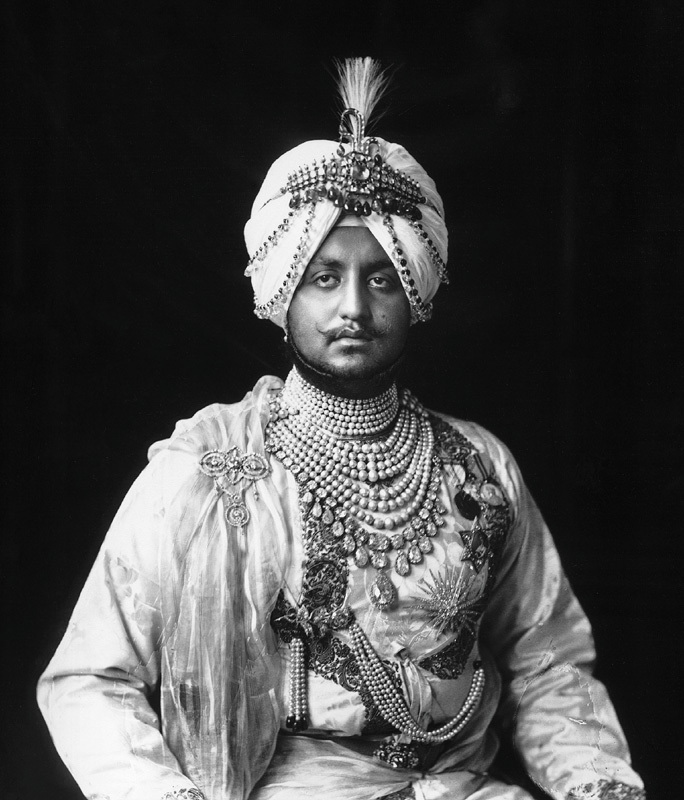 In 1925, the Maharaja commissioned the French jeweller, Cartier, to set the De Beers diamond as the centerpiece of a ceremonial necklace that became known as the Patiala Necklace. 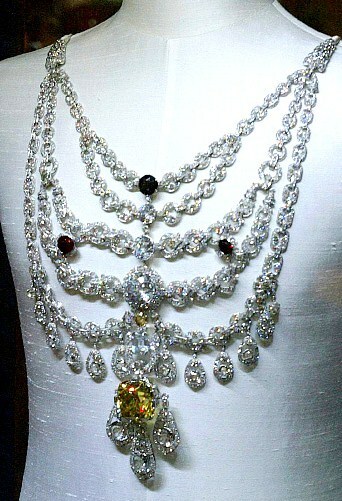 In its original form, the necklace contained 1000 carats in 2,930 diamonds and other previous stones. It was completed in 1928 and is one of the most expensive pieces of jewellery ever made. Today, it is estimated that the Patiala Necklace, in its original form, would be worth in the region of $30,000,000. With the decline of The Raj in the 1940’s, the crown jewels were sold off, and the Patiala Necklace disappeared. 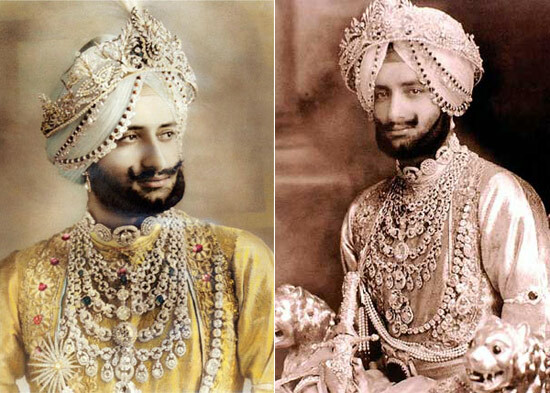 The last sighting of the necklace was in 1946 as worn by the son of Maharaja Bhupinder Singh, Maharaja Yadavinder Singh, in the photographs below. Half a century later, the necklace was discovered in a second-hand jewellery shop in London by a Cartier representative. The De Beers diamond and the other large stones were missing. The remnants of the Patiala Necklace were bought by Cartier. 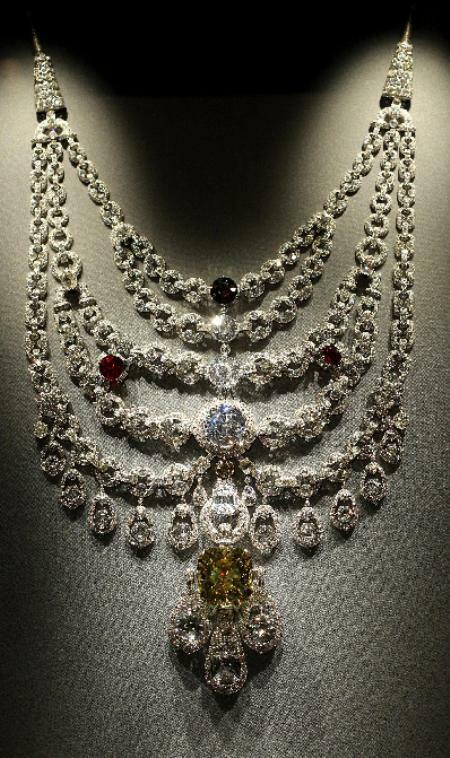 It took two years for Cartier to restore the necklace, using synthetic stones to simulate the distinct colours of the diamonds and other stones of the original. In 1982, the De Beers diamond came up for auction at Sotheby’s in Geneva. 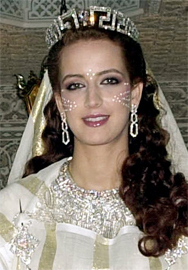 Lalla means ‘lady’ in Morocco and it is a part of the royal title of Her Royal Highness Princess Lalla Salma the Princess Consort of King Mohammed VI of Morocco. Lalla Salma is the first wife of Moroccan royalty to be publically acknowledged and awarded a royal title and she has entered the world stage with a portfolio of state duties and charitable causes. This is Morocco’s First Lady and a very stylish and striking blend of the traditional and the modern Arabic woman. Lalla Salma is 33 years old and has two children. She was born Salma Bennani in the Morrocan city of Fez to a middle class Moroccan family and she is a computer science graduate. Lalla Salma is an exotic beauty, a reflection of the influences of both Arab and French cultures that makes Morocco so scintillating, and what makes her all the more fascinating in the Arab world is her porcelain complexion and curly red hair. 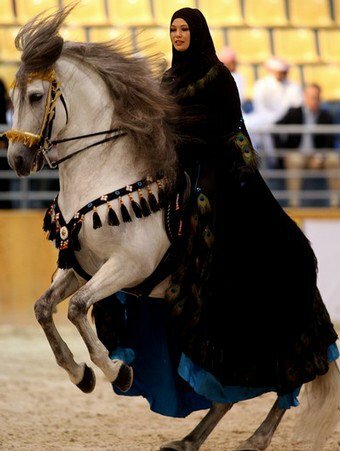 I think that this lends her a doll-like quality when dressed in the traditional Moroccan dress of the takchita.